Register Log In GliderCENTRAL Forums Bonding & Relations 2 or 4, difference?? I have no idea if this is the right forum, but here I go. You all warned me about gliders being addictive and they sure are, haha, I've found two platinum/platinum mosaics (I think) in need of a new home. They have been on a fairly good diet, but I don't really agree with the cage setup. Too small in my opinion and they haven't had proper places to hide and sleep (only open hammocks), which I'm guessing would be a little stressful for the two girls.. Anyway I'm considering taking them in and giving them the home they deserve if they can get along with my current gliders, but my question is, is there much of a difference having 2 girls vs 4? I would hope that everything goes okay, but if they can't get along then I would probably try to find a new home for them. I don't have space for two large cages in my small apartment permanently. I've had four from the beginning. The ONLY downside I've discovered it trying to encourage/bond with the less outgoing ones when having a couple extremely outgoing ones. A little bit of mental tracking & encouragement easily sovles this issue. Under the circumstances I think it's worth a shot. 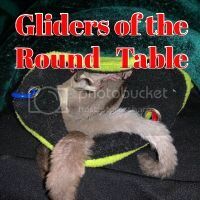 There is no guarantee the person relinquishing the gliders will find another better home than yours, and if it doesn't work out, you seem at least willing to foster while finding a good home for them.